I vote at probably the friendliest, most charming polling place in the state. My neighborhood is an old millworker neighborhood, and the polls are staffed with friendly little old ladies. There is never a line, and there are never people out front hassling you. I was all fired up and ready to refuse to show my photo ID, but they were so busy fussing over my sick (but still cute) kid that they didn’t even ask me. Voting was fun and went smoothly. I remember being in high school and moaning that I haaaaaated politics, and thinking that politics is all rich bossy people shouting at each other. I remember being assigned to write reports on current events in 11th grade, and thinking how boooooooring it was. Being disinterested in politics is incredibly immature. As citizens, it is our right and responsibility to vote. Politics are intertwined in every level of daily life, whether you are conscious of it or not. And yes, it’s true that one vote doesn’t have a loud voice, but it has some voice. And it’s your responsibility to make sure it is heard. Work is b-a-n-a-n-a-s right now, and has managed to devour most of my energy and creativity. 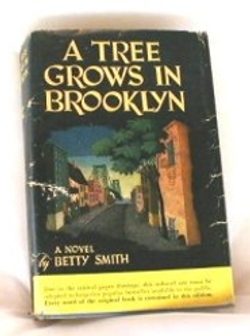 So I’ll just share that I’m currently reading A Tree Grows in Brooklyn, and loving it. I remember seeing this book on our living room bookshelf growing up. Even thought I was an avid reader, it never occurred to me to pick it up. Probably because it was my mom’s book, and in my mind anything my mom read was lame. Now, of course, we toss recommendations back and forth. It only took about 20 years for me to accept that my mom can have respectable taste in some things. I am nervous about election day tomorrow. I am impatient and anxious. I know I’m going to be distracted, and refreshing refreshing refreshing the internet. I wish I could just wake up, go vote, and then sleep through the rest of the day, and wake up when the votes are all in. The waiting is going to kill me. Maybe it is because I have strong feelings about the election, or maybe it’s because we only watch Sprout/The History Channel/OnDemand in this house, none of which show campaign attack ads, but it seems like I’m the only person in this country who is not completely burned out on hearing about election-related things. Relatedly, I’ve been eagerly waiting for The Campaign to hit OnDemand. 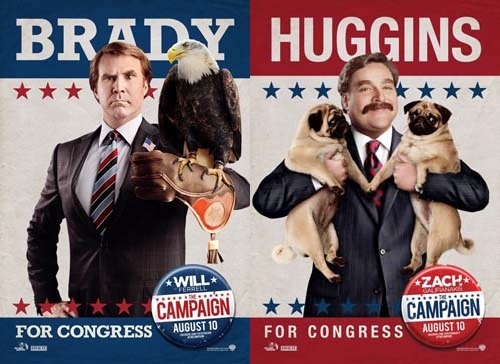 In The Campaign, Will Farrell is Cam Brady, incumbent politician and darling of the establishment who has gone a bit off his rocker. 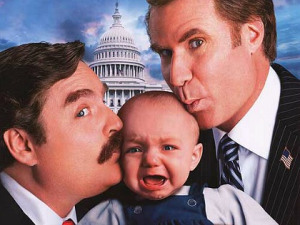 Scared off by his erratic tactics, the establishment picks a new frontman– Marty Huggins. In this campaign, they both go for throats. The Campaign was hilarious. Granted, I think pretty much anything Will Farrell is in is hilarious. This movie worked especially well because it is timely, but also because neither of the chracters are modeled on actual current candidates. That would have been tiresome. But both Cam Brady and Marty Huggins are so absurdly unique, the movie is a lot of fun. So now we’re back to the real campaign. Mr. Beez and I have a bottle of champagne for Tuesday night, either to toast the victory of our candidate, or to drown the sorrows of his loss. Everyone enjoy your extra hour of sleep tonight! And consider spending Tuesday night watching The Campaign instead of stressing out in front of TV coverage of the polls (like I’ll be doing). HELLO, Friday! Between overbooking myself for a million events, Mr. Beez being out of town all week, and working from home yesterday because Baby Beez wasn’t feeling well, this has been one BUSY week. I’m in a great mood this morning. I woke up to an email from a client saying “Nice Job!” on something I wrote, and although my “To Do” list is still long, I managed to cross a good number of things off of it yesterday. To top it off, Mr. Beez returns from Florida this afternoon, and we’ll spend the evening sampling beers at the Cystic Fibrosis Foundation Brewer’s Ball. 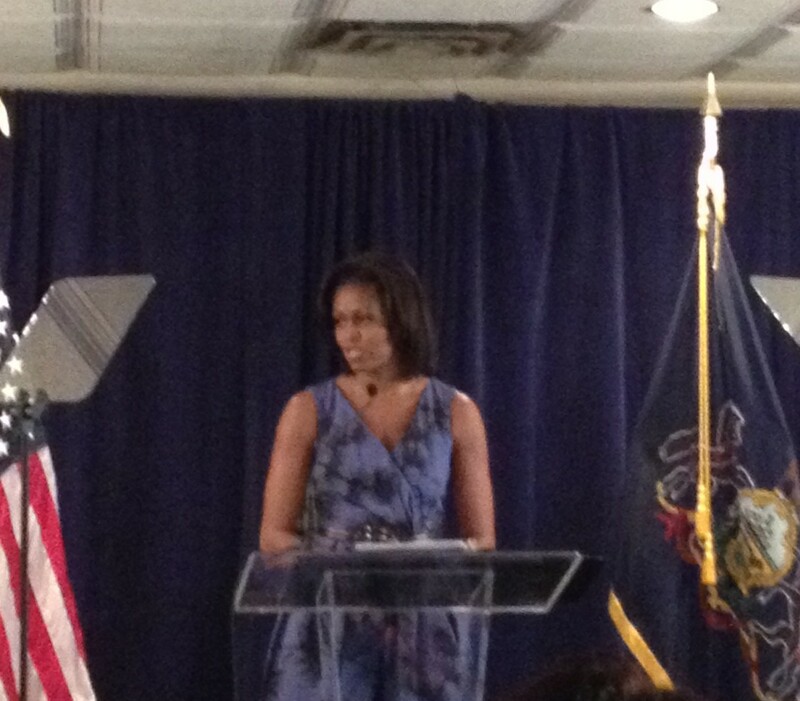 Now on to the highlight of my week– the reception with Michelle Obama! 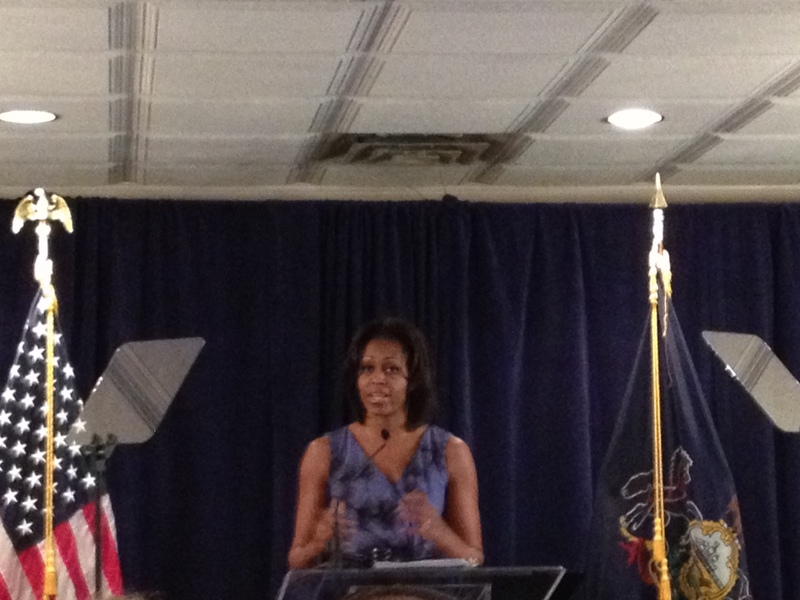 Mrs. Obama came into town for a quick fundraiser to raise enthusiasm for Barack Obama’s reelection campaign. Conveniently for me, the reception was in the same building as my office, so I didn’t have to worry about transportation logistics. I went with my friend Regina and her mother, and we were all SUPER EXCITED about the event. Regina is serious business, and as soon as we made our way through security and into the reception, she beelined up to the velvet rope. We got the absolute best cheap ticket place in the house. If you paid thousands of dollars, you had a spot right up in front or a seat. Everyone else was general admission right behind. Thanks to Regina’s determination, we were at the very front of the cheap ticket section, and directly in front of Mrs. Obama. The reception was scheduled to start at 2:30, but Mrs. Obama did not arrive until 5. There was plenty of grumbling about the wait from the crowd. I have a feeling that she wasn’t running late, it’s just that a long lag was scheduled for purposes of the Secret Service clearing everyone. It took a while to get through that security, and I would think they’d want to get everyone through and get the room settled down before they shuttled her in. Mrs. Obama was articulate and friendly. She communicated a clear political message, but also shared anecdotes of her childhood. She seems like the kind of person you could sit down with over a cup of coffee, and discuss foreign relations or the kids’ dance recital with equal ease. I would be so interested to pick her brain about what her husband’s office has meant to her career. The role of First Lady is sharply defined with expectations of charity projects and “mothering” type initiatives. I am sure all her initiatives are genuinely meaningful to her, but there are only so many hours in a day. How has she felt about being directed into that role, and away from her own interests and accomplishments in law? I’ve felt beaten down over the last several months coverage of the Republican primaries. The barrage of attacks on reproductive rights, contraceptive rights, and by extension the integrity and intelligence of women is draining. Mrs. Obama’s pride over her husband’s accomplishments in his first term, and her enthusiasm for the future were refreshing and much needed. 2008 was exciting, but 2012 is going to be hard won.